Owing to our industry expertise, we have carved a unique niche in the industry by bringing forth a vast range of Ultrasonic Anemometers. The Ultrasonic Anemometer 3D serves for the 3-dimensional acquisition of the horizontal and vertical components ofthe wind velocity, the wind direction as well as of the acoustic-virtual temperature. Our reputed entity is engaged in supplying Ultrasonic Anemometer. The windsonic™ is a low-cost 2-axis ultrasonic anemometer, providing wind speed (0-60m/s) and direction data in a robust housing. This anemometer has no moving parts, offering maintenance-free operation in a wide range of applications. The Gill WindMaster™ range of 3-axis ultrasonic anemometers provide wind speed (0-45m/s and 0-65m/s) and direction (0-359º) data. 3-vector outputs are available (U, V, W), along with speed of sound and sonic temperature outputs. 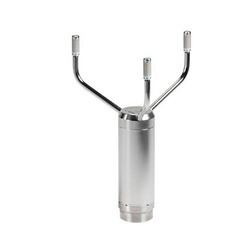 The Gill WindSonic range features low-cost ultrasonic anemometers capable of monitoring up to 60m/s wind speeds. WindSonic M has an all-aluminium construction and anti-icing heating option for extreme environments. Ultrasonic Anemometer measures the time taken for an ultrasonic pulse of sound to travel from the North transducer to the South transducer, and compares it with the time for a pulse to travel from S to N transducer. Likewise times are compared between West and East, and East and West transducers.